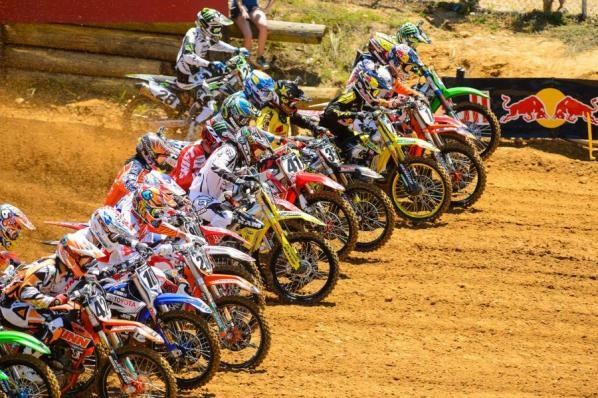 Coming off the first off weekend of the season in the Lucas Oil Pro Motocross Championship, there was a question as to which riders would benefit most heading into round five of the series, the Red Bull Budds Creek National. Answers came in a variety of forms, and at the end of the day, the series really did look a little different than it did after the first four rounds. It certainly looks a lot better to the two defending champions in the 450 and 250 classes, as they each railed around the rough, hilly track en route to the overall wins, and a much-needed momentum boost as the series nears the halfway point. Red Bull KTM’s Dungey got his 450 win by going (2-1) and besting Monster Energy Kawasaki’s Ryan Villopoto, who went (1-2) on the day. Villopoto won the first moto to give him nine moto wins in ten starts this season, but Dungey, the only rider so far this year to beat Villopoto, answered back again in moto two with the victory. The European duo of Ken Roczen and Marvin Musquin had owned the 250 Class over the last two rounds with the pair winning three of the last four motos. But the American tandem of Blake Baggett and Eli Tomac silenced the European Union with impressive come-from-behind wins (Baggett in moto 1, Tomac in moto 2). A wrist injury has hampered Baggett throughout much of the season but scores of (1-2) were good enough for the Monster Energy/Pro Circuit Kawasaki rider to garner his first overall on the season. In 450 Moto 1, MotoConcepts Mike Alessi secured the Motorcycle-Superstore.com holeshot, with Dungey right behind. Their run was very short-lived as Villopoto quickly struck in the second turn to pass both riders and take the lead. 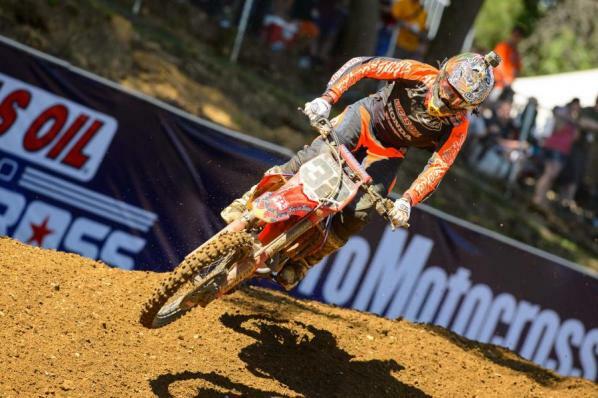 Dungey was not far behind, as the defending champion worked his way into second ahead of Alessi. 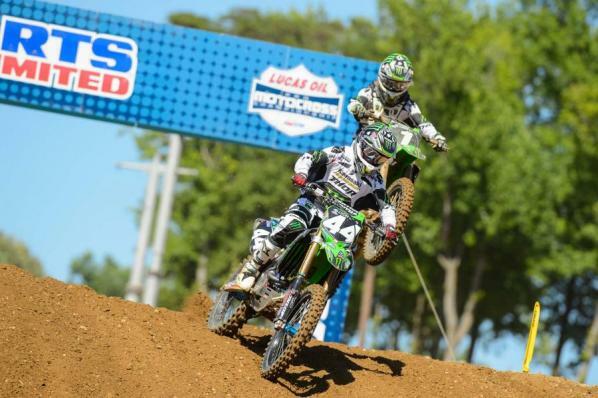 Behind the leaders the battle for third was materializing between Alessi and Rockstar Energy Racing’s Ryan Sipes. The fastest qualifier in practice, Yoshimura Suzuki’s James Stewart, was buried outside the top ten. Alessi nailed the Motorcycle-Superstore.com holeshot from the outside. Villopoto was flawless the first moto, but a bad start in the second cost him the overall. Villopoto was able to open a gap over Dungey in the early running, in an attempt to establish dominance at the top of the first moto. But Dungey, riding as aggressive as we’ve seen all season, began to tighten the gap—methodically clipping tenths of seconds off RV’s lead. But the battle that was beginning to materialize was abruptly cut short as Dungey went down in rollers, ending a valiant comeback attempt. Dungey was slow to get up, but still soldiered on to finish second. Villopoto would cruise from there with Dungey, Alessi, Honda Muscle Milk’s Justin Barcia and Sipes rounding out the top five. 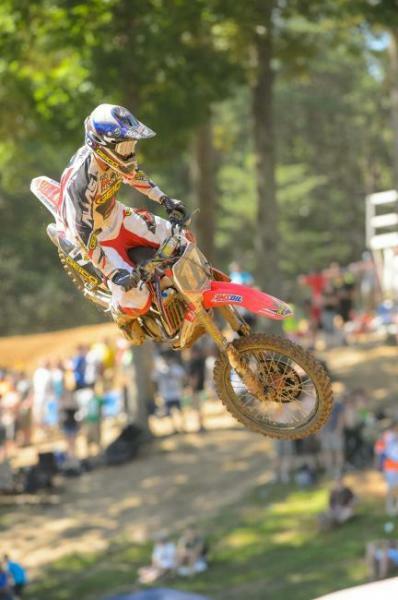 Trey Canard would take sixth ahead of Justin Brayton, Jake Weimer, Malcolm Stewart and Broc Tickle. Alessi earned another Motorcycle-Superstore.com holeshot award in the second moto, but Dungey was once again right behind him. Dungey was able to take command of the lead shortly after the first step-up jump and began pulling away. First moto winner Villopoto wasn’t buried in the pack, but sitting around tenth isn’t the position you want to be in when your toughest competitor is out front extending his lead. James Stewart was also floating around tenth after the start. Villopoto and Stewart diced for a couple laps until Villopoto turned up the heat and dropped Stewart. Villopoto made it into second place ten minutes into the race, but Dungey had already opened up a 15-second gap. Villopoto needed to put in a ride of a lifetime if he wanted to take home the overall win, and he could not make such a charge come to fruition, with Dungey actually able to further extend the lead during the second half of the race. Stewart steadily worked his way up to fourth, and then inherited third when Alessi swapped out and went down. Alessi rode without a clutch lever for several laps before succumbing to a DNF. Then Lucas Oil Troy Lee Honda’s Malcolm Stewart came out of nowhere. Malcolm pulled up into fourth and latched on to his older brother’s pace. Malcolm must have found an edge somewhere because he was right up on James after just a few laps. Chatter started up in the mechanics area as Malcolm reeled in James, but the battle between brothers never happened as James went down in the rollers before the finish line. Malcolm rode unchallenged to a third-place finish—his best 450 finish to date—while Villopoto settled in second. 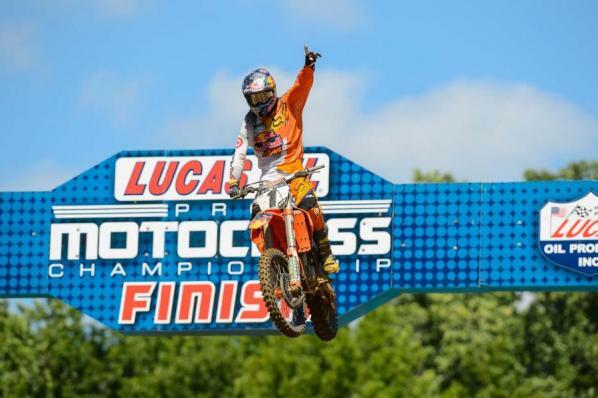 Dungey took the second moto win, which also gave him his second overall win of the season. When the dust settled, Dungey and Villopoto had tied on points for the day, with Dungey getting the win via the second-moto tiebreaker. Honda Muscle Milk’s Canard was consistent despite two bad starts, and he took third overall for his first National podium of the season. scoring third behind Dungey and Villopoto. 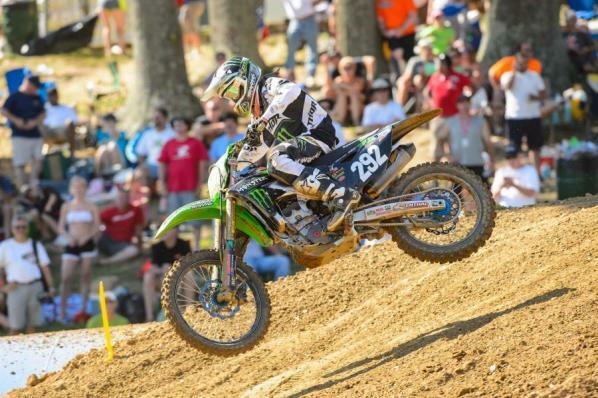 Ryan Dungey bested Ryan Villopoto with a last-moto win to take the overall. In the 250s, the return of GEICO Honda’s Wil Hahn, the new 250 East Supercross Champion, was overshadowed by the debut of amateur sensation Adam Cianciarulo’s professional debut. Both missed the first four rounds of the series due to injuries and ailments, and ironically both were in the spotlight as Hahn grabbed the moto 1 holeshot with Cianciarulo in his rear-view. The two returnees lead was erased by Marvin Musquin early in the moto. It appeared Musquin was going to cruise to his second consecutive moto win as he opened an early lead. 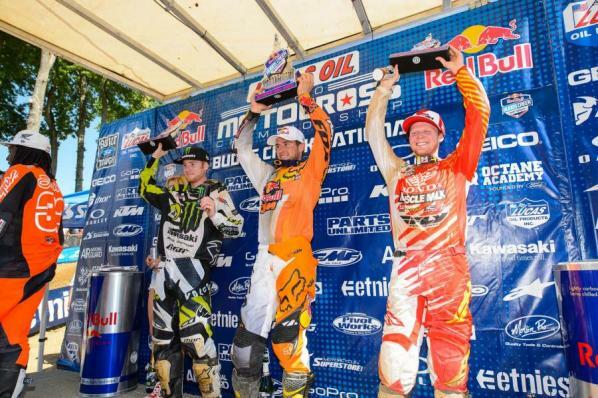 Eventually Musquin’s Red Bull KTM teammate Roczen moved into second, and the two seemed set for a 1-2 finish. But Baggett sliced through the pack, and, looking like the Blake Baggett of old, the defending champion was crushing the outside, bouncing off the turns to pass Roczen on Henry Hill. Baggett’s attack was just beginning as he quickly went after Musquin, again using the outside to charge past the Frenchman. Baggett would take the moto win with Musquin holding off a last ditch effort by Roczen to secure second. Jason Anderson, Eli Tomac, Wil Hahn, Kyle Cunningham, Joey Savatgy, Jeremy Martin and Justin Hill would round out the top ten. Blake Baggett for the majority of the second moto. Eli Tomac had a phenomenal ride in the second moto to take the win. As superb as Blake Baggett’s first moto come from behind win was, Eli Tomac may have topped it in moto 2. It was Tomac’s GEICO Honda teammate Hahn who secured the Motorcycle-Superstore.com holeshot—his second of the day. 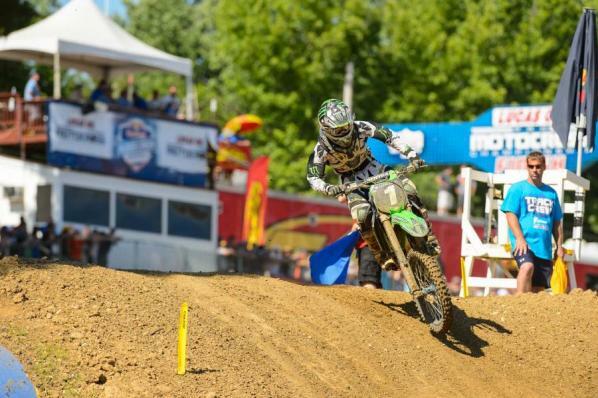 Hahn was joined up front by Monster Energy/Pro Circuit Kawasaki stablemates Darryn Durham and Baggett. Durham, who has struggled with injuries for the better part of a year, quickly took away the lead from Hahn—the first time he has lead a race since High Point in 2011. After a nearly flawless first moto performance it appeared Baggett would dispose of Durham and runaway with a 1-1 performance. But Durham held his ground, keeping Baggett at bay for the first half of the moto using a smooth line through the rollers to help provide distance. With Durham and Baggett trading blows up front, Eli Tomac was making a charge for the ages through the pack. After another bad start left him outside the top ten, Tomac began to click off lap times that were at points two and three seconds faster than the leaders. After trimming Durham’s lead to within seconds late in the race Tomac struck quickly, first passing Baggett and then disposing of Durham. Tomac would take the moto win with Baggett taking second following a late pass on Durham. 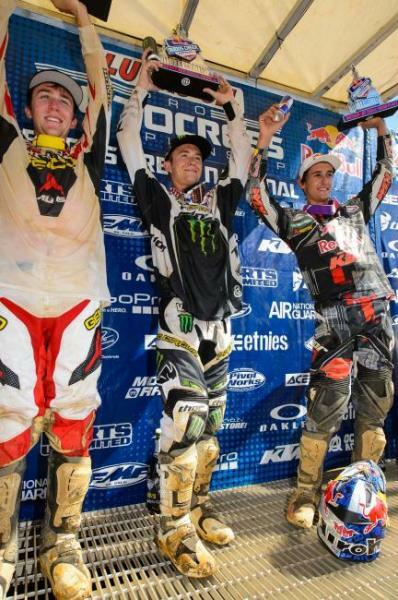 Durham finished third for his first career moto podium. Zach Osborne made a late charge to take fourth in front of Hahn, Ken Roczen, Marvin Musquin, Justin Bogle, Kyle Cunningham and Justin Hill. Blake Baggett’s 1-2 score were good enough for the overall. Tomac on the heels on the second moto win would finish second via 5-1 scores. Marvin Musquin would round out the podium via 2-7 moto scores. 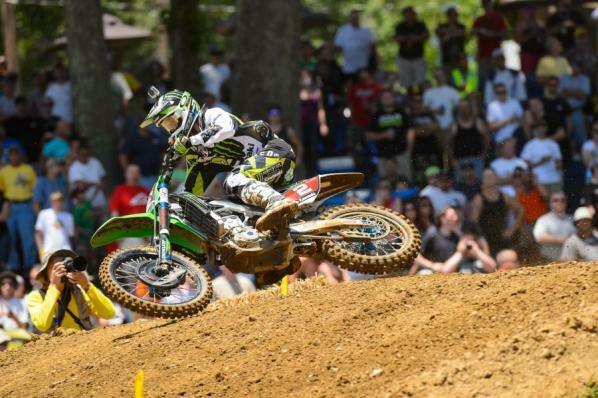 Adam Cianciarulo made his debut this weekend at Budds Creek. Blake Bagget had solid 1-2 moto scores to take the overall win.